Habbo is a social networking site aimed at teenagers. 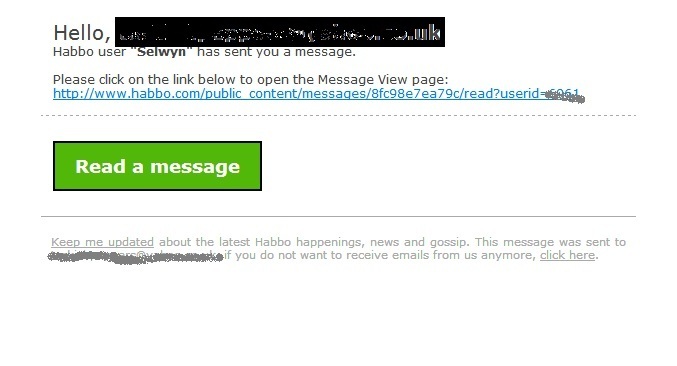 The spammed-out email invites the recipient to follow the link in the mail to open the message send by the Habbo user. On closer inspection of the link, it will take you to a website in Russia which has nothing to do with Habbo. Do not click on any of the links in the email. Just delete the email. Unless you are a member of Habbo and expect to get emails from them, the safest thing to do is to is block all email with “Habbo” in the subject line. If you are a member, log in the usual way without clicking on the link. Tagged as: Habbo email scam, Habbo Hotel, Habbo spam, Habbo user "Adrian", Habbo user "Selwyn"